Welcome to DAY 30 (!) in my "30 Days of Blues". I care about this cause so much, and this was such a little thing for me to do, but dang if I don't want another color on my nails. LOL. 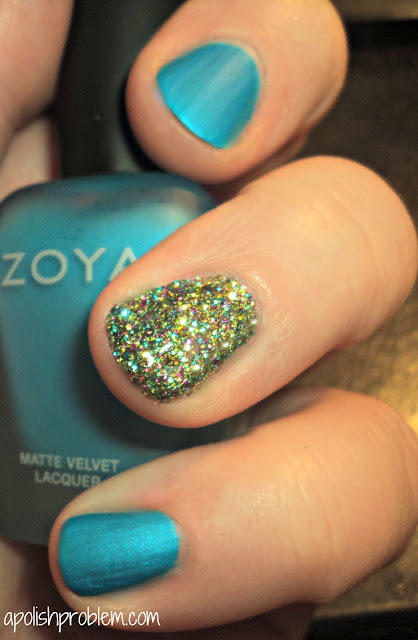 This is 2 coats of Zoya Jo, a medium, dusty, denim blue shimmer. I used Nfu Oh 61 and BundleMonster plate BM21 for the bottom stamped design. 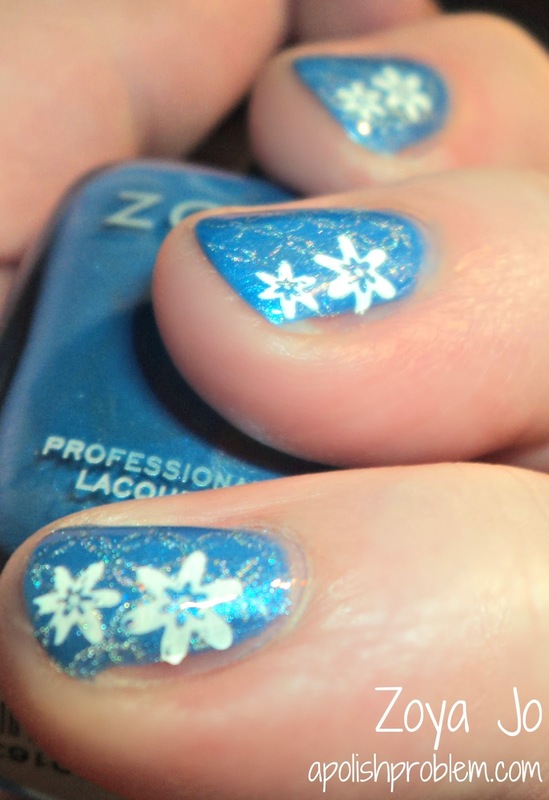 I then used Konad White Special Polish and BundleMonster plate B11 for the flower. I kind of did this out of necessity because the BundleMonster full-nail designs don't completely cover some of my wider nails. Thus, I applied the flower as a way to mask this. However, I really love this design. I'd forgotten just how much I love layering stamped designs. 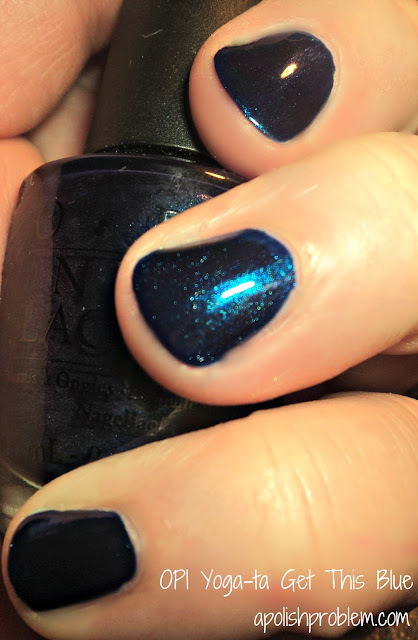 This is 2 coats of OPI Yoga-ta Get This Blue, a deep blue shimmer from OPI's 2009 Spring India collection. I just checked and it looks like it's still in OPI's line-up. Come back tomorrow for the last day in my "30 Days of Blues". 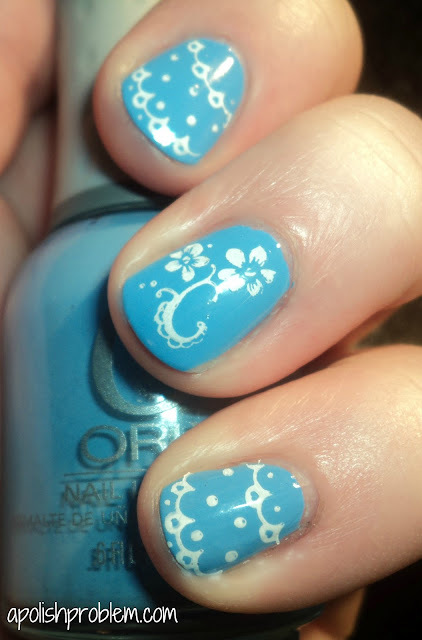 This is Nicole by OPI "Baby" Blue, a light blue, as the base color. 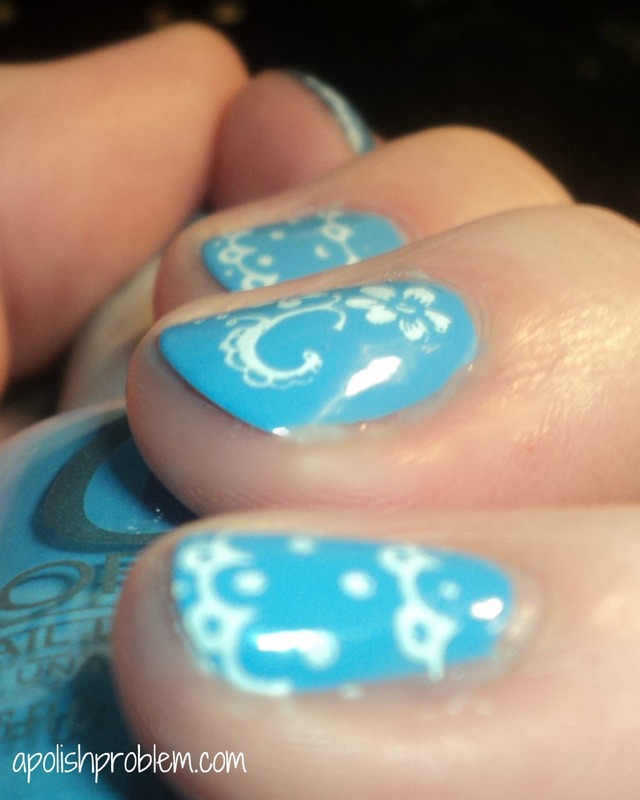 I then topped Baby Blue with a coat of Nicole by OPI Rich in Spirit, a silvery-blue foil, on my tips. I then stamped a design using BundleMonster plate B39 and Konad Black Special Polish. Sorry so short today, but I have a gazillion things to do. Plus, it's one of those rare days where I'm just not feeling very wordy. Thank you so much for reading my "30 Days" posts. Just 2 days left. As always, you can email me at megan@apolishproblem with any suggestions, questions, or comments. It is just the perfect dusty shade of periwinkle. Unfortunately, I had topcoat bubbles (which make me stabby), so I had to slap some glitter on it to mask them. I chose KleanColor Chunky Purple Holo, which is a clear, light purple base loaded with multi-chrome glitter (it's not a holo). 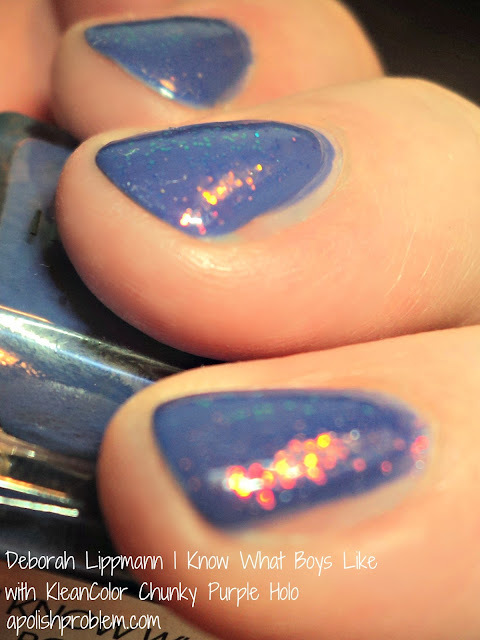 This 3 coats of I Know What Boys Like, and 2 coats of Chunky Purple Holo. Best part? I know have the song by The Waitresses running though my head. :P And now you may have it, too. LOL. 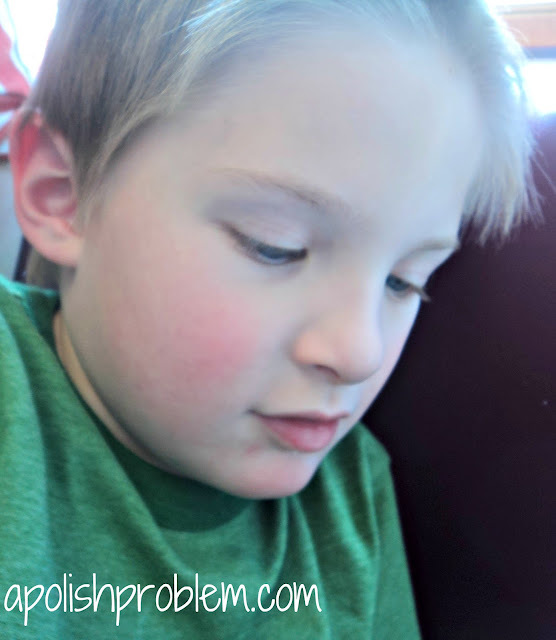 During my month of blues for Autism Awareness, I had plans to take short breaks from the polish and share a little bit about us and our journey with autism, and I have just been so busy, I haven't had the chance. Well, I'm taking it now. He is 6 years old. He was officially diagnosed with autism last year. He and his twin sister are my most favorite people. He loves to play on computers and his Nintendo 3DS and basically anything that makes boops and bips. He has a dog. His name is Sam. Well, we have 2 dogs, but he and Sam are BFFs. He loves his sister, but she drives him nuts. He loves to cut his hair (see his handiwork?). He says "take a nap" when he's had too much interaction. He doesn't want a nap. He just wants you to quit bugging him. He is scared to death of Spongebob Squarepants, but he loves Dora and will laugh uncontrollably at Wow, Wow, Wubbzy. His favorite TV channel, outside of NickJr, is The Cooking Channel and his favorite chef is Julia Child. He had some hard times at school, but now he has found an amazing place. 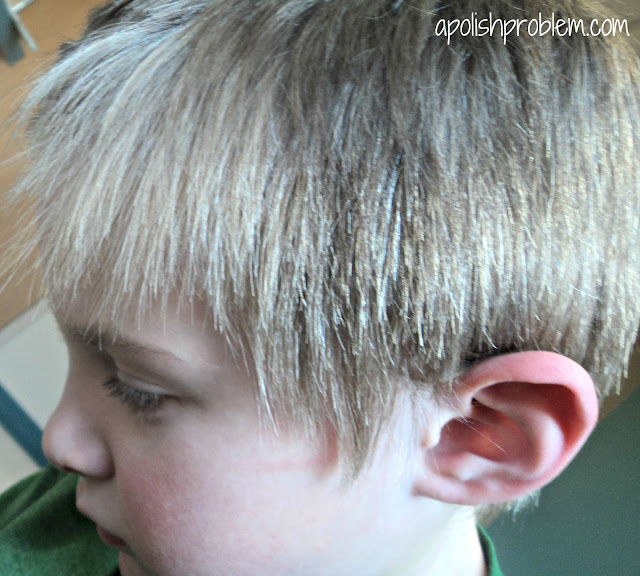 His favorite friend at school is Zach. He can READ. Not just "moon", "dog", and "cat". He can really read. Better than his 8 year old cousin. It's amazing. He has come so far in such a short period of time. He is now conversing with us, and we are actually seeing more of Blake every single day. 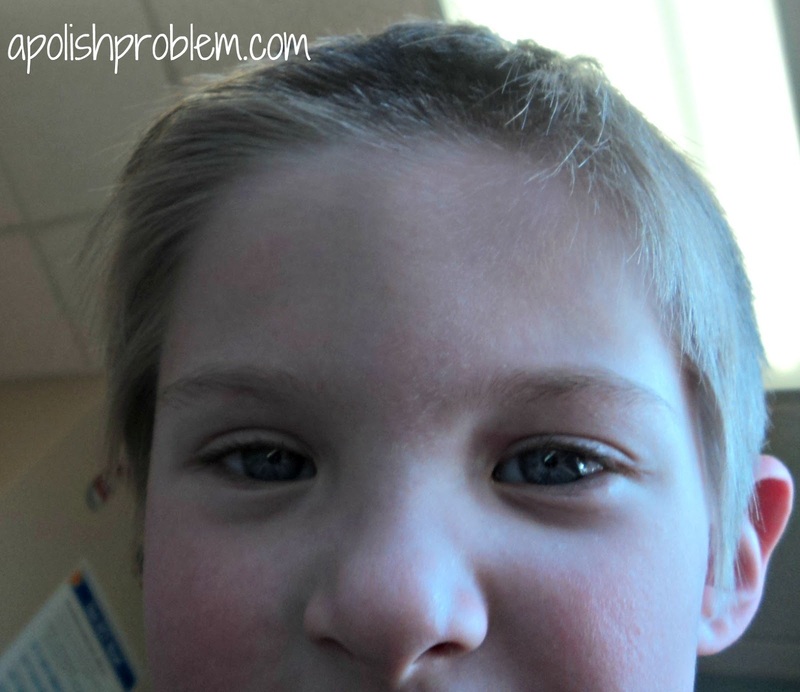 He is an amazing little boy, who has challenged me in every possible way. I am better person because of him. He has changed my definition of normal. He has taught me what "true love" means. Things can still be hard and everyday has a new challenge, but I no longer see autism as a bad word. I just see Blake. Today is Day 25 in my "30 Days of Blues". I'm nearing the end, and I'm so happy. 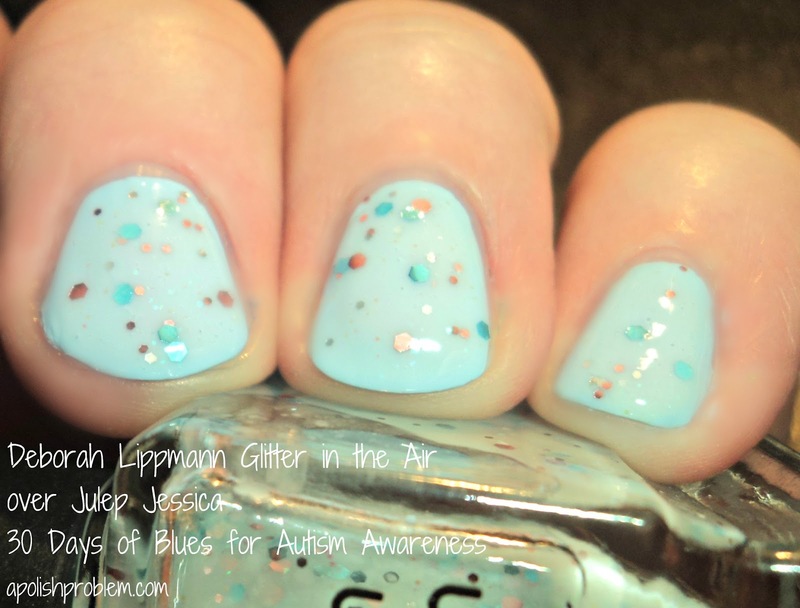 Because as much as I love blues, and as much as I love this cause, I really want to wear some other color on my nails. LOL. 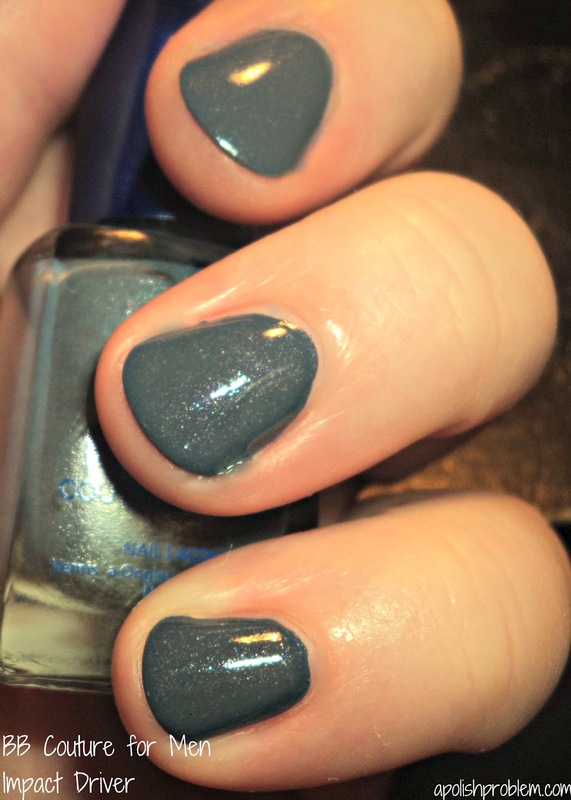 This is 3 coats of Impact Driver, which is a deep grey/blue base with multi-colored shimmer. I picked this one up awhile ago, because I had read that it was a dupe of Rescue Beauty Lounge Catherine H. Honestly, I don't think it's a dupe, as Catherine H. is more of a Wedgwood blue, rather than a greyed-blue. That said, it's still an amazing shade. FYI, be sure to enlarge the pics, so you can really see the shimmer. It's fantastic. 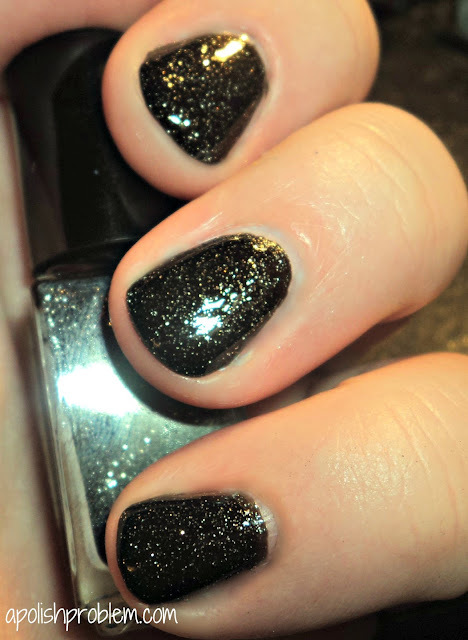 The formula on this one, like all BB Couture polishes, was perfect. As you all may know, since this blog started, I have let people post their blog URL with their comment. I know a lot of bloggers think differently, but I have always felt that it never affected me if someone was to include their blog information along with their comment, so why not allow them. I have also had the comments on this blog open and un-moderated. That is simply because it's what I prefer as a blog-commenter myself. I always like having my comment instantly appear on a blog, rather than having to go through the moderation process. So that is what I did with my blog. Unfortunately, due to a recent influx of link spam, I am having to re-think this policy. Thus, as of today, 4/25/2012, all comments on A Polish Problem will be moderated. I'm on the blog everyday, multiple times a day, so unless you post during my overnight hours, it shouldn't take but a few hours, if that, to have your comment appear on the blog. Also, I have also re-evaluated my policy of allowing links in the comments. I realize I could still allow blog links in comments, while not posting the comments with the spammy links, but I figured a blanket policy would be much easier. That means that I am no longer going to allow blog URLs to be posted within comments. I remember how hard it was for me (and in some way still is) to gain readers. That's why I've allowed bloggers to post their links in their comments, as I've always felt that I can use this blog as a way to promote other blogs. I hate doing this, but I hate seeing spam in my comments more, and this is the only way I can control it. As comments are now moderated, please know that any comment that includes a link will not be posted. At first, I thought I could edit them, but I use Blogger's comment system, and it doesn't allow editing. I will continue to post the Blogger Round Ups to help new and new-ish bloggers promote their blogs. Rather than posting your URL in your comments, from here on out, if you are not in my blogroll, or if I have not previously featured you, please request to be in my next Round Up post. To do this, you can respond in the most current Round Up post or Round Up reminder post. You can find out more information, by clicking the above "Blogger Round Up" tab. You can also email your requests to roundup@apolishproblem.com. If you have a product website or a product you would like me to review, please do not post your information within comments. Rather, please contact me at megan@apolishproblem.com or apolishproblem@gmail.com. This picture, and the one above it are both 3 coats of both polishes. You can see just how much lighter IKB:2012 is than Royal. Also, you can see some of the formula issues I had with IKB:2012. It's quite uneven without a topcoat. This picture is 2 coats of Royal and 3 coats of IKB:2012. As I was taking pictures of both polishes at 3 coats, I realized that it would probably be good if I showed you a comparison between 2 coats of Royal and 3 coats of IKB:2012, and they are the closest in color at that number of coats. 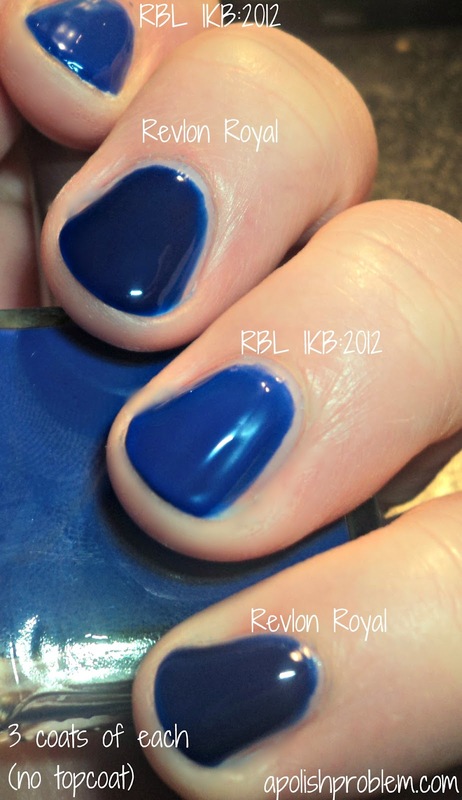 As you can see, Royal is a brighter cobalt blue jelly, whereas IKB:2012 is still bright, but it also leans a bit purple, and it has a dustiness to it, that Royal does not. I know that Ji mentioned on Rescue Beauty Lounge's FB page and on Twitter that IKB:2012 is currently out of stock, pending filling all of the orders. It may be back in stock after all orders are filled, but no guarantees. 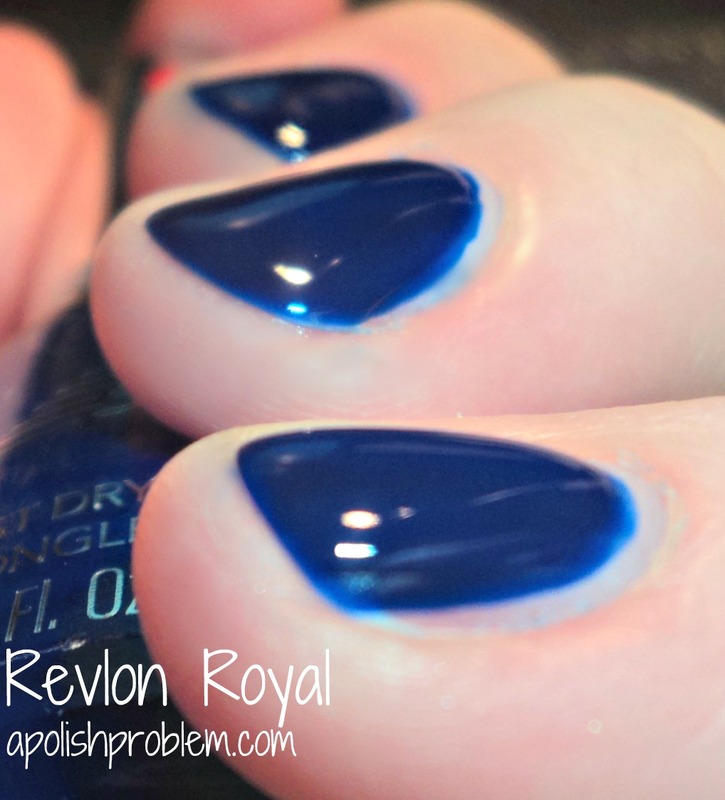 Revlon Royal is readily available on Revlon's website, as well as through other online outlets, and at drugstores and big boxes nationwide. This is 3 coats of Revlon Royal, a bright, cobalt blue jelly. I did 3 coats, because I had a thin spot on my ring finger. If I had waited more time between my first coat and my second, I wouldn't have had the thin spot, as it was from drag. So it's definitely a polish that can be opaque in 2 coats, just make sure to go slow. I also recommend 2 coats, if you can, simply because it's brighter at 2, rather than 3 coats. I'm not sure why I hadn't picked up Royal before. I'm not a huge fan of Revlon's formula, so maybe that is why. I also thought it was going to be more of a creme, rather than a jelly. Not sure where I got that. LOL. Anyway, Royal is a perfect cobalt jelly. I hate to say it, because essentially it means that I wasted $20, but this is so much better, in my opinion, than RBL IKB:2012. 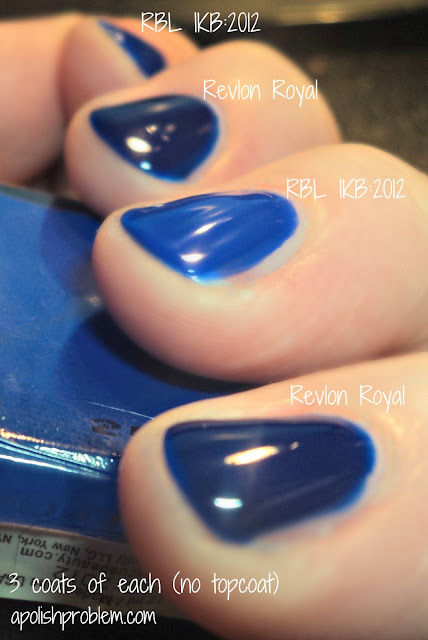 Though, I do need to do a direct comparison between IKB and Royal just to make sure, I think that this polish is what I wanted IKB:2012 to be. Best part, this Revlon cost me $6 and that was at Walgreen's. If you can get it at a big box (which the ones around me are always OOS of Royal), it's less than 5 bucks. If you would like to be included in my next Round Up, please reply in this post. 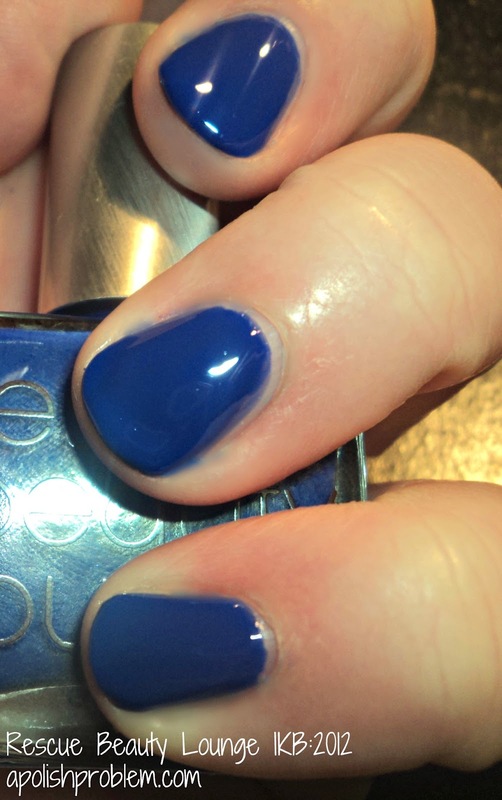 This is 3 coats of Royal Navy, which is a bright, cobalt blue jelly packed with aquamarine micro-shimmer. I love this blue. It definitely hits all my check-boxes that I was looking for in a cobalt blue. I kinda wish they'd make this without the shimmer. Though, it is fantastic with the shimmer. I hate to say it, but sans the shimmer, this is what I wanted IKB:2012 to be. Thank you for reading. As always, you can email me suggestions or questions to megan@apolishproblem.com. This is 3 coats of IKB:2012. Back when Ji posted the nominations for the RBL Fan Collection, this one (inspired by Yves Klein blue) was my pick, and I've anxiously been waiting for it to come out. However, recently, due to a aggressive, get-rid-of-debt, tight budget, I've been rationing my polish money, so I wasn't sure if I would even order any from the fan collection. 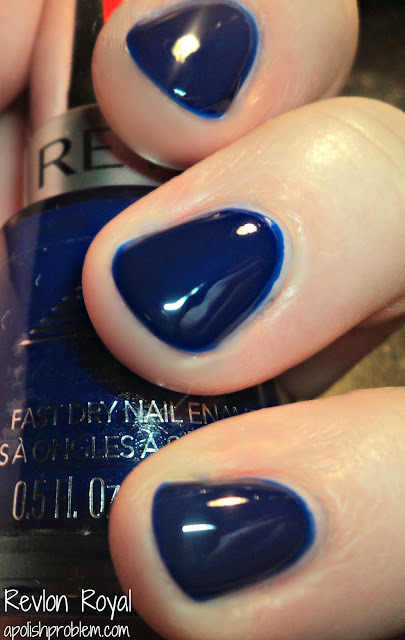 Finally, as blue is my most favorite polish color, I figured I'd splurge and go on and get it because I would probably regret it if I didn't. That's usually the way things work with me and RBL polishes. So, needless to say, I had a lot of expectations for this polish. When I pulled it from it's box (when did the red boxes happen, btw), I expected angels singing hallelujah, and I didn't get that reaction. That is why I recently posted on Twitter that I was a little bit disappointed. In fact, I've been swatching it off and on today thinking I'll like it more. I think the main reason is because I had been associating this blue, Yves Klein blue, with a cobalt blue. It's not. Cobalt blue is much more electric. This blue is dustier, and ever-so-slightly purple Once I took a step back and realized this wasn't my perfect cobalt blue, I started to appreciate it more. Also, when I first put it on, it almost looks like a very bright periwinkle. It took 3 coats (and on my middle finger, there's a fourth because I bumped my nail) to finally reach a fully-saturated blue. It also takes several coats to reach the color that you see in swatches. Until I applied my third coat, I kept thinking that everyone's camera was blowing out the color, and that the brighter periwinkle color that I was seeing was the true color. It's definitely blue, though. 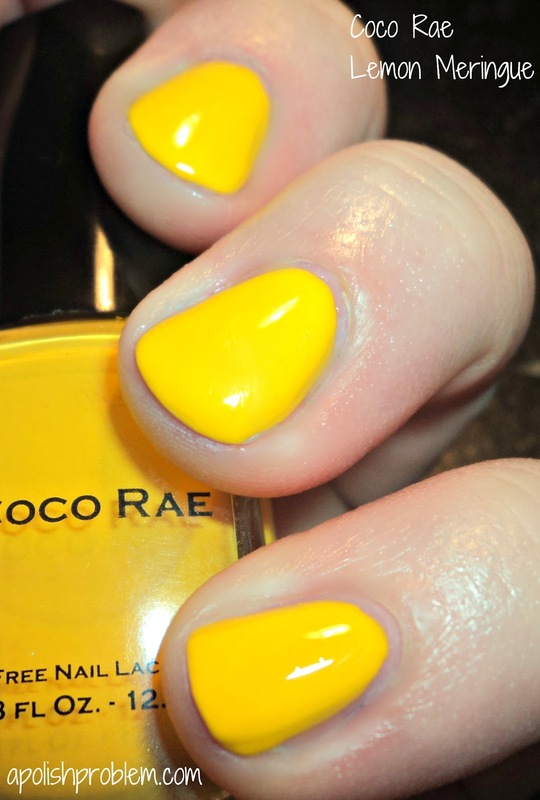 I'm a little unhappy with the formula, as it doesn't have the buttery quality that I associate with Rescue Beauty Lounge, and with a $20 polish in general. I found it to be very stringy and at one point, I thought I had a hair in my polish. I didn't. :/ I found it to be harder-than-most to apply. 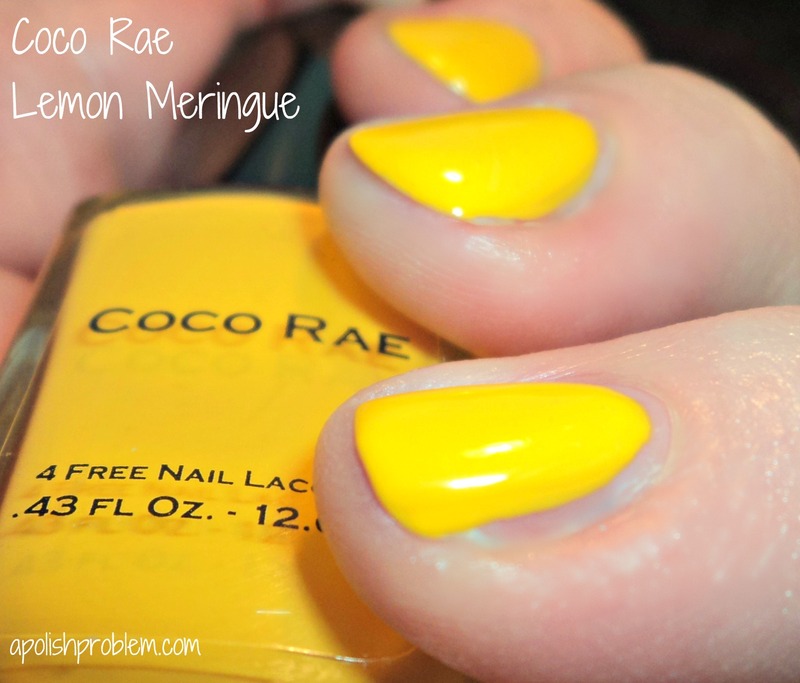 Ji mentioned on her Facebook page that this polish has pure pigment in it. That is why it is stringy. I get that. The color does remind me of those tubes of pigments we used to use in art class in middle school. However, it's still frustrating for the price. I'm not unhappy I purchased it, per se, it's just not exactly like I expected. You know how when something costs more, you expect it to be perfect? Like when you spend $6000 on your dream DisneyWorld vacation at the Polynesian and your autistic son kinda flips out at all the stimulation and you have a lousy time, but yet the same behavior on a $1000 beach vacation doesn't ruin the trip? (not that I've ever experienced that. LOL) It's like that. If this was a $5 polish or even a $10 polish, I could kind of overlook the issues I had with it. However, on with a $20 polish, I don't want formula issues, if you know what I mean. If you are a blue-lover you may still wish to pick it up for color alone, just keep in mind that it's not without it's issues. Thank you so much for reading my 30 Days posts. Tomorrow, I will be back with a full manicure. I also will be posting the Blogger Round-Up tomorrow (I'm sorry for not getting to it sooner). 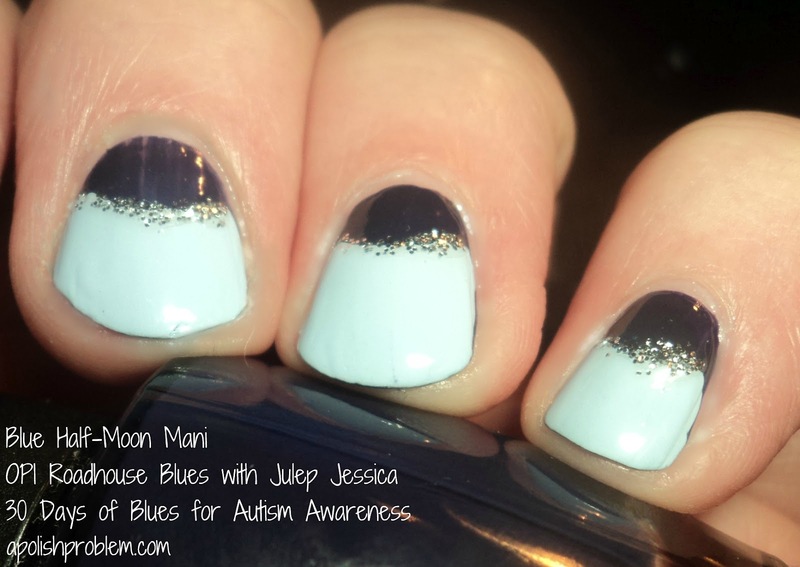 Today is Day 21 in my "30 Days of Blues" for Autism Awareness. Today's manicure is inspired by my complete obsession with Deborah Lippmann Ray of Light. Seriously. I stare at every swatch I can find and have my cart loaded on Lippmann's website. 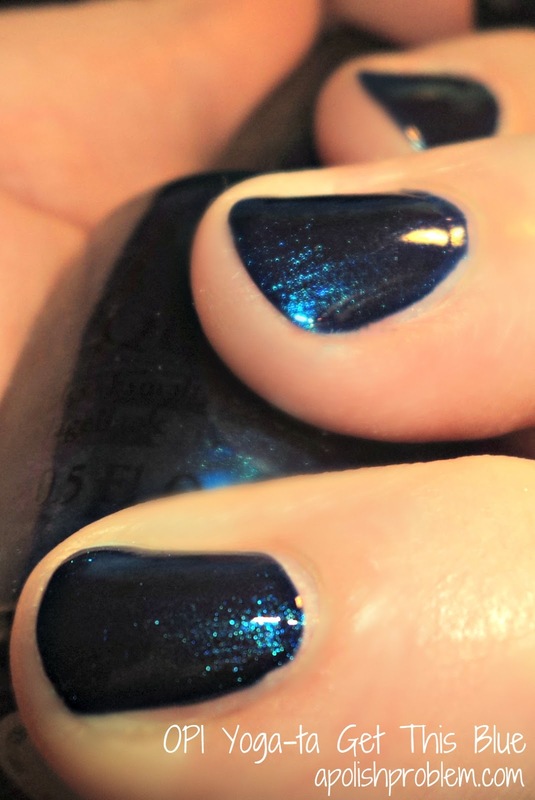 This is 2 coats of Nubar 2010 (a mylar flakie topcoat similar to Sally Hansen Hidden Treasure et al) over 2 coats of Barielle Berry Blue (a deep blue jelly-ish creme). I think this would have looked much better if I'd been able to use a true, deep blue jelly, rather than just a polish with a jelly-ish finish. I tried to layer Berry Blue with 2010 and Berry Blue just covered up the flakies. There was no "jelly sandwich" effect with this. So, I opted just to use 2 coats of 2010 over the basecolor. 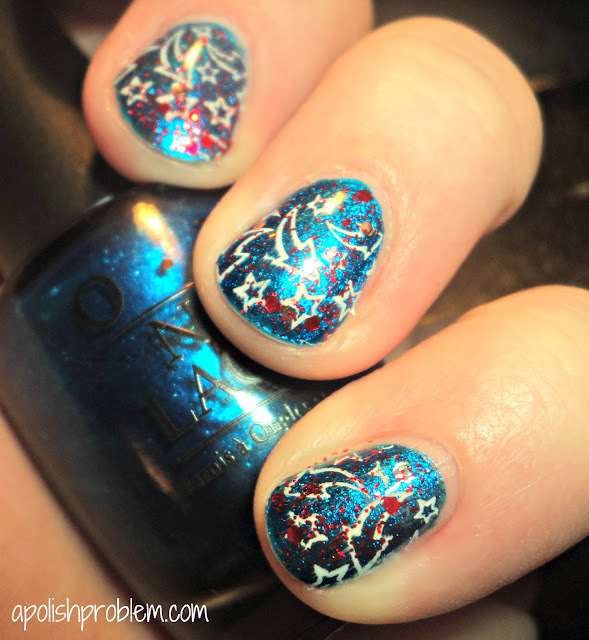 If I had to do it over again, I would probably go lighter with the flakies so it looks closer to the Lippmann. I think this looks similar to Deborah Lippmann Ray of Light, but it's by no means a dupe, and at some point, I will probably end up purchasing Ray of Light and then complaining about the thick formula. If you have a deep blue true jelly, I think you would be much more successful creating a dupe to Ray of Light. Berry Blue and 2010 are both readily available, and both retail in the $8 range. 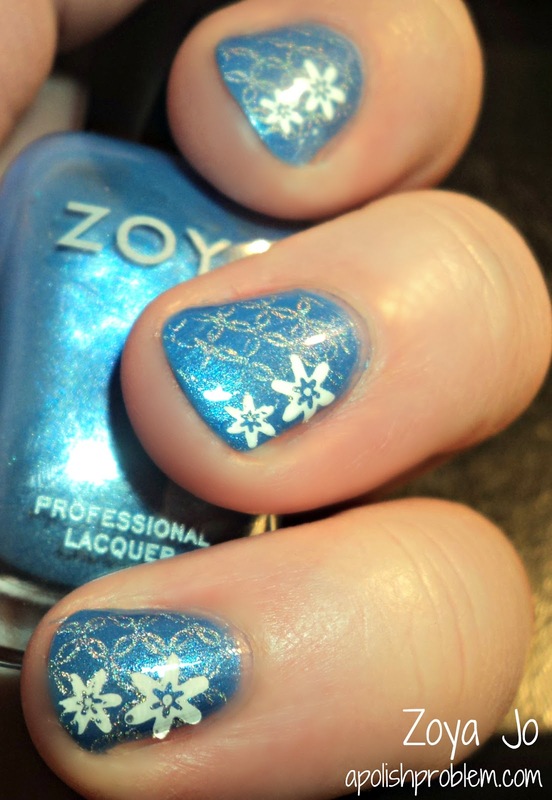 This is 2 coats of Orly Snowcone topped with designs from Konad plate m77 using Konad White Special Polish. Snowcone is a cornflower blue creme, but you wouldn't know it from these pictures. No matter how many pictures I took, I couldn't get complete color accuracy. The bottle color in the first picture is probably the closest to the actual color. Nevertheless, Snowcone is an amazing blue creme. 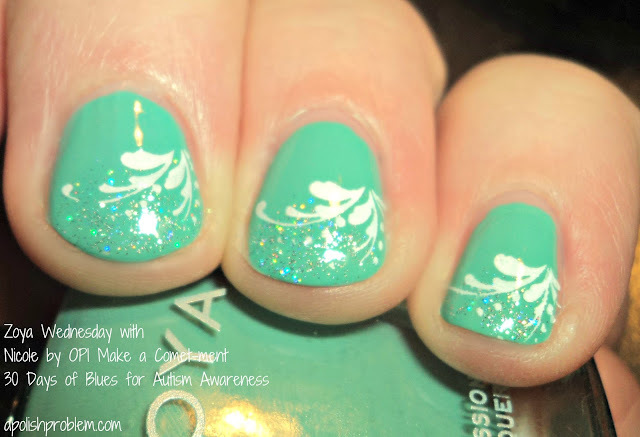 It came out with Orly's 2010 Sweet collection and it is still available. Thank you all so much for reading my "30 Days of Blues" posts. I will be posting the Blogger Round Up later today (and it actually may be the early hours of tomorrow), but I will get to it... promise. Yesterday, I showed the second of the ombre sets from The New Black, and today, I have for you the black/grey ombre set, "Graffiti". Bright Silver Glitter in a Clear Base - when I first saw this one, I wasn't impressed, and I then I put it on my nails and I was practically blinded by it. It looks like a frickin' Miss America tiara on your nails. It would be very hard to reach opacity, though, as it's not quite thick enough. I used 4 coats on the above swatch, and I still had bald spots. Bright Silver - pretty standard silver metallic, though this one is verrrry bright. It almost looks polished. Formula was fine and took 2 coats to reach opacity. Medium Grey with Blue, Purple, and Pink Shimmer - this one is where it get's interesting. This polish is fantastic. The shimmer stands out in this one and is quite the contrast with the grey base color. 2 coats. 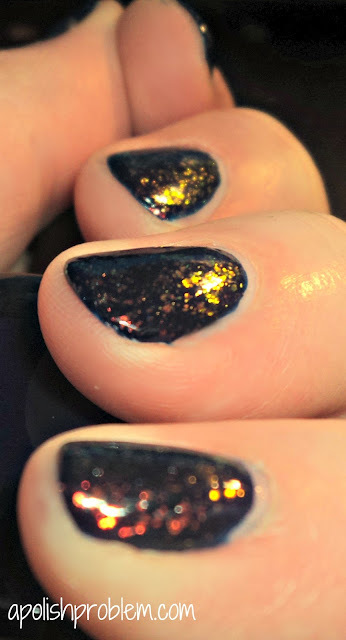 Black Jelly with Gold and Silver Glitter - okay, remember in yesterday's post when I wished The New Black would sell a few of their polishes separately, in larger bottles? Well this polish would be at the top of the list. I cannot tell you how amazing this polish is. It's not a traditional jelly, in that you can reach opacity, but it's also not a creme. It is jam-packed with glitter, but it's not gritty. Formula was great. 2 coats. Jet Black Creme - this is a nice black creme. It was completely opaque in 2 coats and I had no formula issues. I like this set. I really like the way it goes from a deep, jet black to a bright, super-sparkly silver glitter. But the stars of the show, in my opinion, are the grey and the black jelly. These sets retail for $22 and are available online and at major department stores. Best news... The New Black is now available at Sephora.com. This set was sent to me for review. The picture of the 5 pc set was sent to me by The New Black's PR. Today is Day 19 in my "30 Days of Blues" and unlike most days, today, I am incorporating a product review in with my "30 Days" post. I've been meaning to review the rest of my The New Black sets for the past month or so. Then I got busy with doing the daily blue posts and I had a bad break on my swatching hand, so reviews kinda got pushed to the back burner. 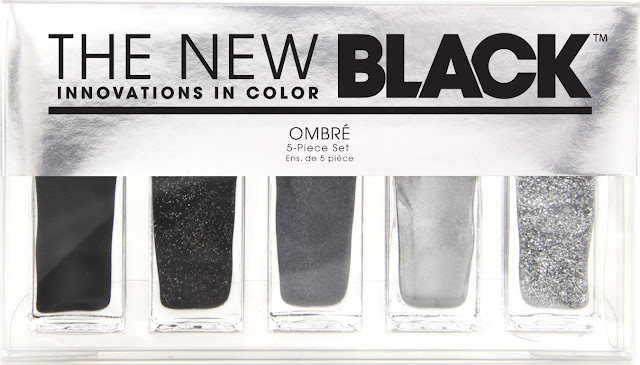 As The New Black doesn't label their polishes, I am describing these by name. From pinky to thumb, there is a bright white creme, a pale blue creme, a aqua blue peal with a pink flash, a cornflower blue, and a navy shimmer. Bright White Creme - this one is such a nice white, that I wish it came in a larger size. It was almost opaque at one coat. I just had to do a second coat to cover one thin spot. The formula was excellent. Pale Blue Creme - this one rivals Julep Jessica, as a favorite pale blue creme, and is another one that I wish came in a full size bottle. It was opaque in one coat and the formula was very smooth. Aqua Blue Pearl with Pink Flash - This one was a really pretty shade. It was a pearl, in my opinion, but there was a bit of frost in the finish. It was probably too much frost to try and wear this polish as a stand-alone shade, but as part of an ombre set, I liked it. That said, I did think this one was a bit of an odd duck in the ombre set, as it's the only one that leaned green or aqua. Also, the pink flash in this one was beautiful, and not one that you really had to work for. The flash was evident from the moment I put it on. 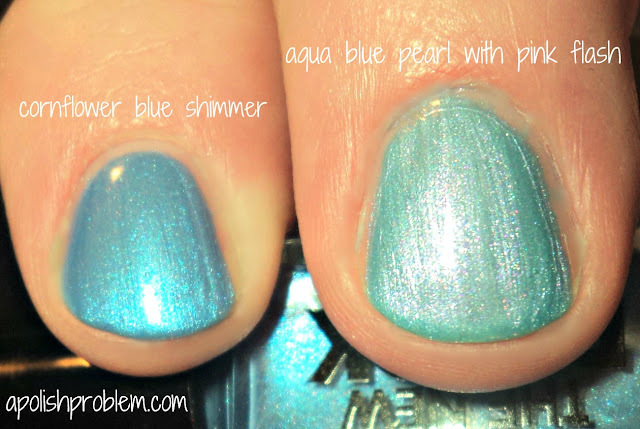 This one was one of the thinner polishes in the collection and it took 3 coats to reach opacity. 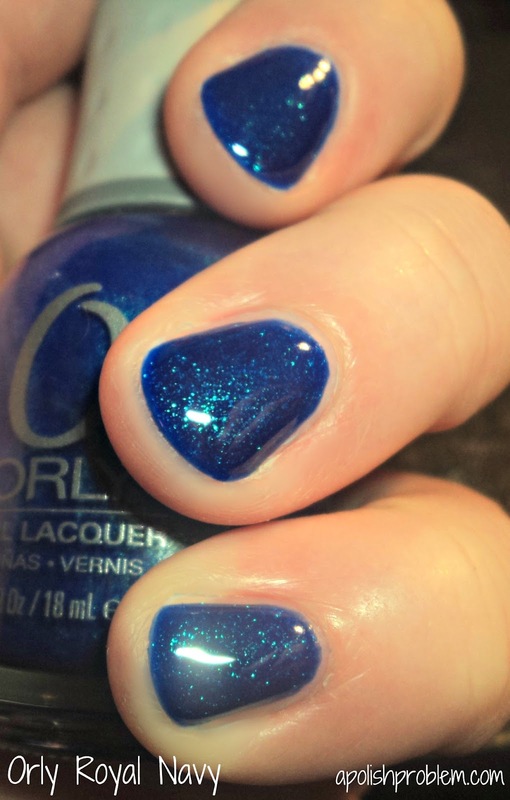 Cornflower Blue Shimmer - This one was such a nice blue. I waffled between calling it denim or cornflower, but it had the tiniest amount of periwinkle in it, thus I called it cornflower. In the bottle, this one had silver ribbons, but those turned out to be part of the shimmer, rather than frost. Like the Aqua Blue Pearl, it was a thinner formula. 3 coats. 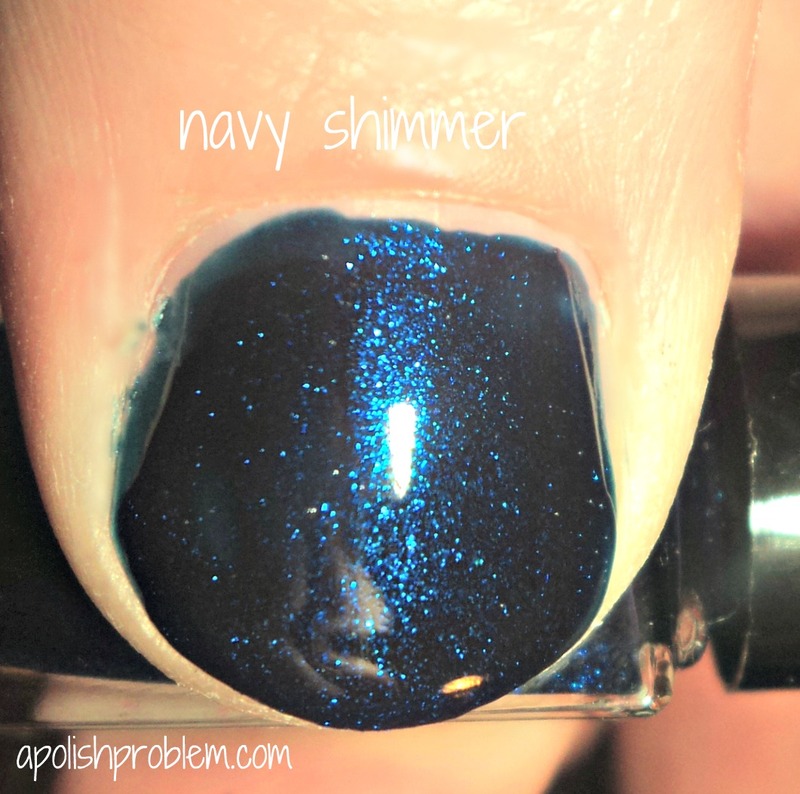 Navy Shimmer - First off, I apologize for the weird placement of this picture. I was rotating all of the pictures of this collection, and I didn't even notice that this one looked weird, before I had edited it and saved it. 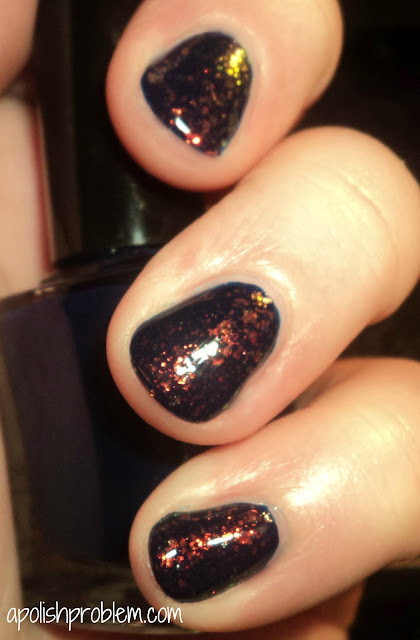 Anyway, this is a beautiful, inky navy with purple and pink shimmer, and is the third polish in this kit that I wish I could have in a bigger bottle. Unlike the other two shimmers, this one had a thicker formula and was opaque in 2 coats. This set contains all of the polishes I featured above. Only they are listed in reverse order from my swatches. 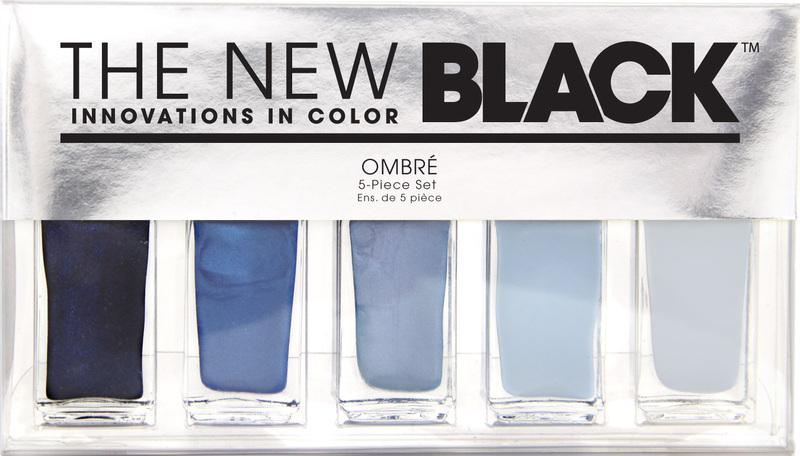 Again, I found myself really liking these ombre kits from The New Black. I love that they take the guess work out of ombre manicures, which is something I love, but fail at when left to my own devices. I do find them to be a bit on the pricey side, but they aren't too outrageous, especially considering you get five polishes. I also find their brush handles to be a little short, but they are mini bottles, so it's understandable. The New Black polish kits retail for $22, and you can now find them at Sephora,com. It looks like the have several new ones in stock at Sephora. If you are interested in this one, please note that this is the blue "Horizon" kit and not the blue/green "Waves" kit (though that Waves kit looks awesome). Thank you for reading my "30 Days of Blues" posts. Remember, tomorrow is the Blogger Round Up, so if you would like to participate, please respond in the latest Blogger Round Up post (the one below this one). 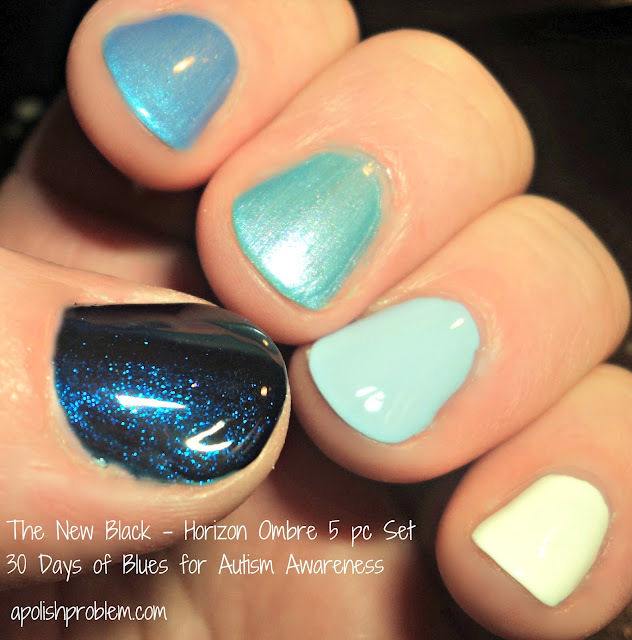 The New Black Horizon Ombre Set was sent to me for review. Image of 5 pc set was provided to me by The New Black's PR. This Friday, I will be posting another edition of my Friday Blogger Round Up. If you would like to be included, and have not previously contacted me, either by replying in a Round Up post or emailing me, please reply in this post. All blogs included in the Round Up, will be listed on my blog, followed by me (provided you have Google Friend Connect) and will be in my blog roll. For more information on the Blogger Round Ups, please click the tab above. This is 3 coats of Zoya Phoebe, a neon, matte cerulean blue, and RBL Locavore, a green, purple, gold, and blue glitter-bomb, on my ring finger. I normally put a topcoat over Phoebe, as I'm kinda over the matte thing, but I liked the contrast so much between the satiny finish of Phoebe and the sparkle of Locavore that I decided to leave it matte. 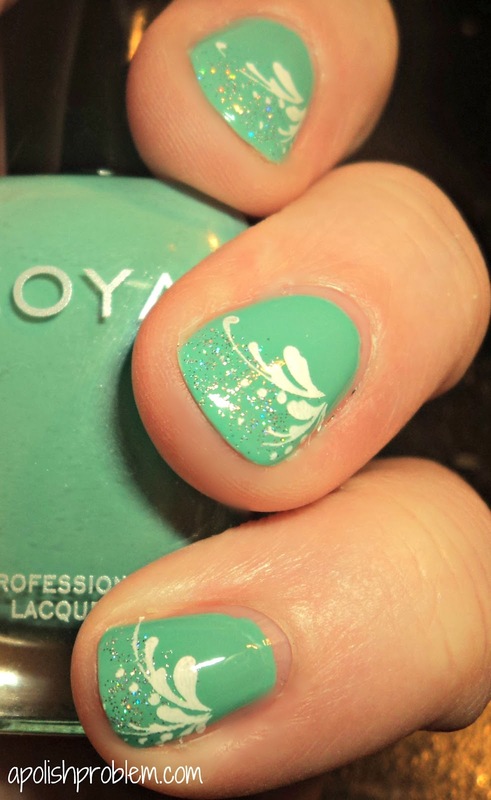 Phoebe is available on Zoya's website, and Locavore is still available on Rescue Beauty's website. 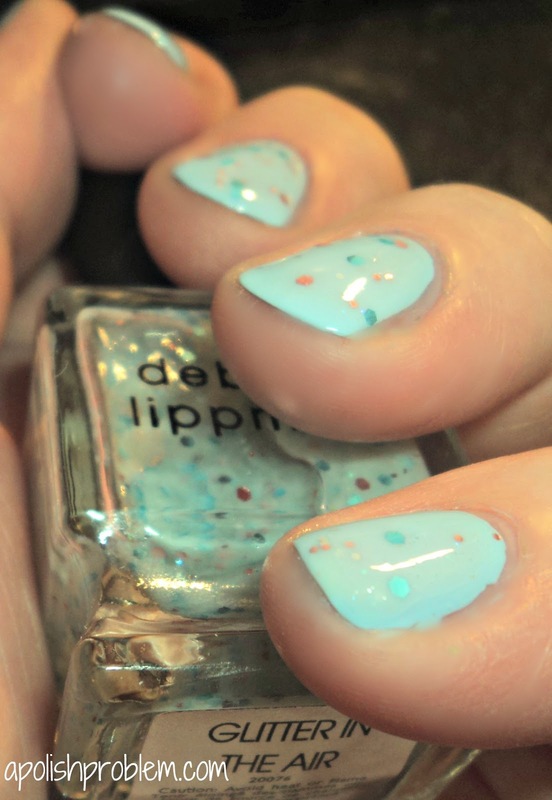 This is 3 coats of Deborah Lippmann Glitter in the Air over, what has become my go-to pale blue creme, Julep Jessica. 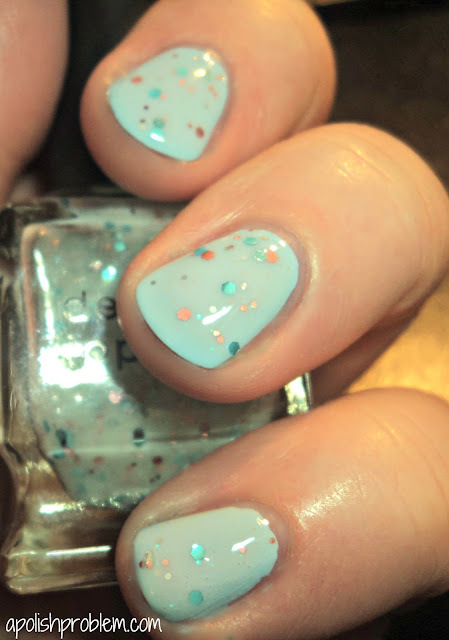 Glitter in the Air is blue and pink, multi-sized and multi-shaped glitter in a milky, pale blue sheer base. Honestly, I love the look of Glitter in the Air, as there is something about it that is almost ethereal. That said, it is a polish that must be layered rather than using it on it's own. Otherwise, you will find it incredibly frustrating and you may even wonder why you purchased it at all (done that). In my experience, I recommend layering it over a blue base rather than trying to use another color. I've tried it over other pastels, and white, and I just prefer it over a similar-toned light blue. 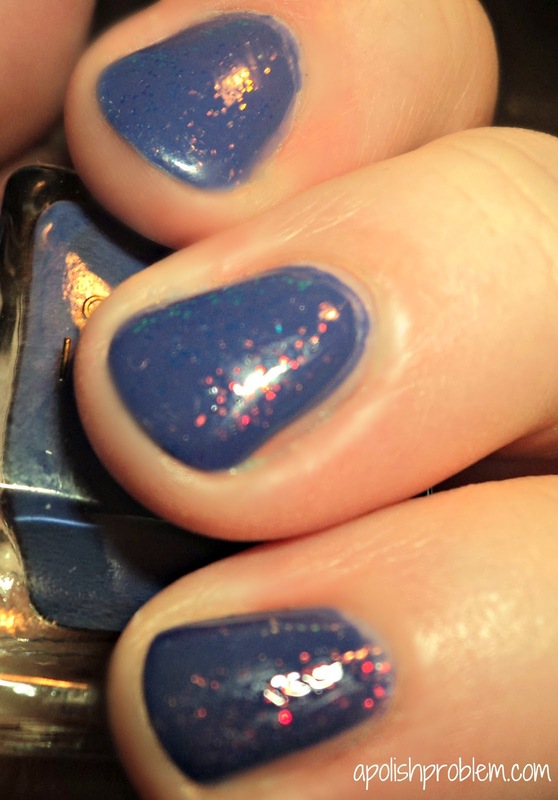 Also, I find that several coats of this one, rather than simply using it as a topcoat, look better, as it gives layers to the glitter, rather than just having the glitter sit on top of the base color, if that makes sense. I know that Revlon has a similar shade, and I'm all for getting lower-priced dupes. However, I oftentimes find myself frustrated with Revlon's brush and their formula. Thus, I don't have the dupe to compare. Also, I find that Lippmann's brushes (along with Zoya's brush and Nubar's brush) are perfect for polishing short nails. I have so much more control with the shorter handle. So, if I can swing the Lippmann (even if there is a dupe), I will usually get that over the cheaper polish. Plus, the formula was great. I did have to work at bit to get the glitter in the right places, but that's par for the course with this type of polish. Bottom line, it's a gorgeous polish. It just needs a little help to look this gorgeous (don't we all. LOL). Lippmann Glitter in the Air is readily available on the internet, and I think it's also available in the beauty departments of larger department stores, such as Nordstrom. Deborah Lippmann polishes retail for $16 and up, though glitters, such as this one, are usually in the $18 range. I usually get my Lippmanns from Zappos, whatshebuys.com, or Apothica.com. 30 Days of Blues for Autism Awareness - I love "blue" "cherry" much! Today is Day 16 in my "30 Days of Blues" for Autism Awareness. Sorry for the completely corny title of this one. LOL. 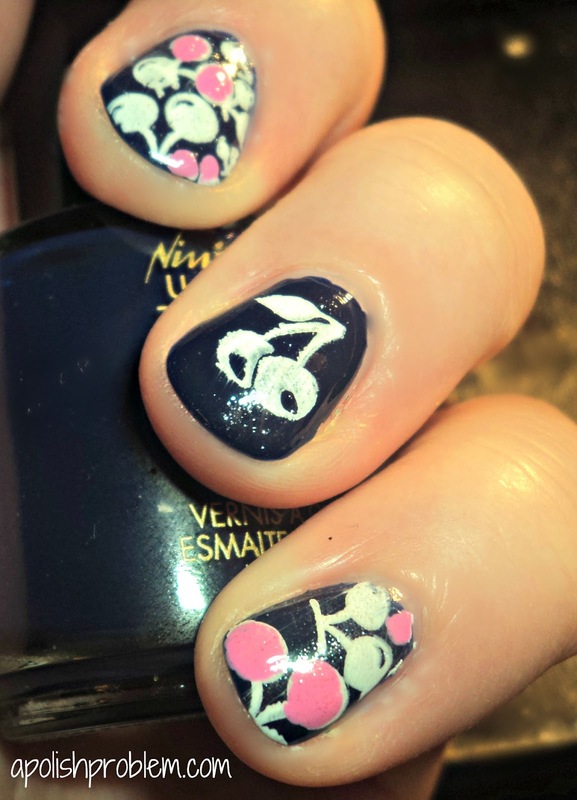 I used 2 coats of Nina Ultra Pro Sailor (a rich, navy creme) and then applied a cherry stamp design using the all-over cherry design from BundleMonster plate BM21 and the single cherry design from BundleMonster plate B70 using Konad White Special Polish. I then used my largest dotting tool and applied Zoya Shelby on a few of the cherries. Last, but not least, I then added a coat of Deborah Lippmann Bring on the Bling. I think this one is so much fun. Unfortunately, Sailor has been d/c'd, but to my naked eye, it looks to be relatively dupey to RBL Dead Calm and China Glaze First Mate (though I didn't do a direct comparison to First Mate and I blog-sold Dead Calm). All the other polishes I used are easily obtainable. Again, I want to thank you all so much for reading my posts during my month of blues for Autism Awareness. It means so much to me. As always, if you have questions, comments, or requests, please shoot me an email to megan@apolishproblem.com. Today is Day 15 in my "30 Days of Blues". Part me is so happy I am half-way through with my 30 Day challenge. That part includes my blue-stained nails. LOL. And yet another part of me is going to miss it when it's over. I think even after this month is over, I am still going to have "Blue Mondays" every week. 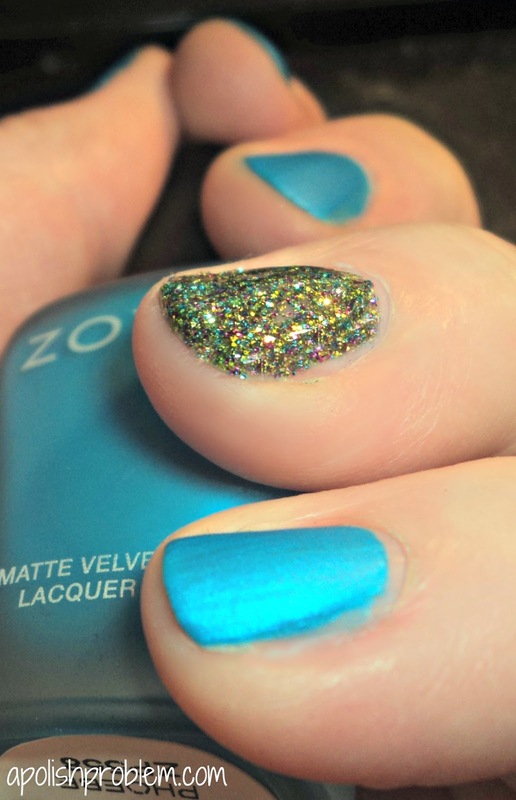 This is 2 coats of Zoya Wednesday that I topped with one coat of Nicole by OPI Make a Comet-ment (a fine, holographic glitter top coat) on my tips. I also added a stamp below Make a Comet-ment using Konad White Special polish and the floral design from BundleMonster plate BM04. Zoya Wednesday is available at Zoya.com and Nicole by OPI Make a Comet-ment is a Target exclusive, but as it's still on Target's website, I'm assuming that it's in the regular line-up and is still available in-store. 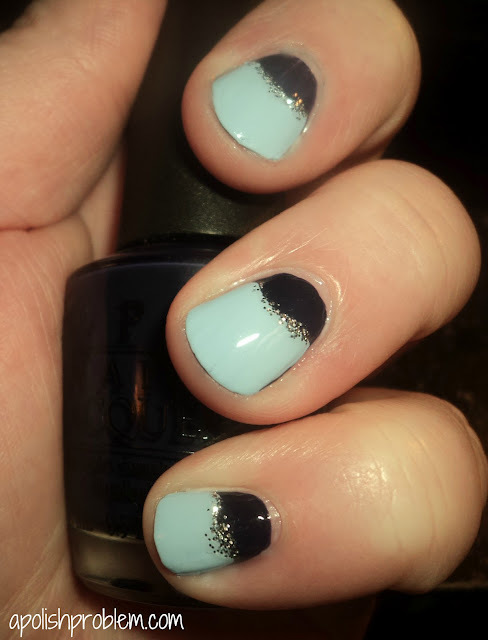 This is one coat of OPI Roadhouse Blues, a rich navy creme from last year's fall collection, with one coat of Julep Jessica over top. Both of these polishes are one-coaters on their own, so that is why I chose them for this manicure. I also used a silver glitter striper over my moon lines. 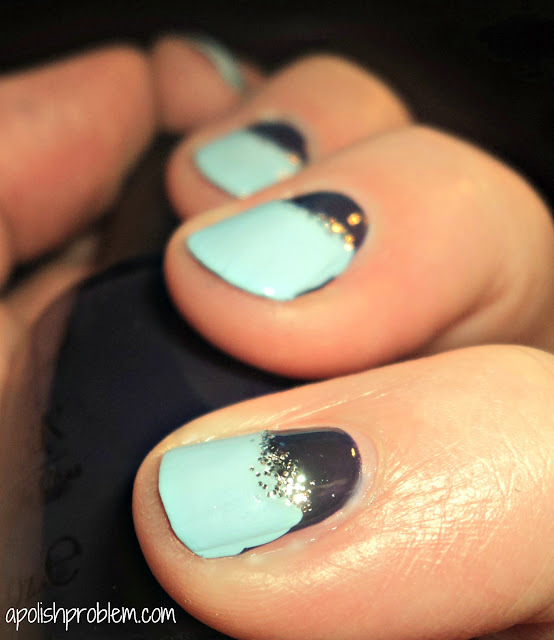 This was my first time trying a half-moon manicure, and I was more than a little intimidated. However, it was actually easier than I thought it was going to be. It was time-consuming, as this took me over an hour, but it wasn't difficult. Thank you so much for reading my "30 Days" posts. I will be updating the participating blogs list over the weekend, so if you are participating or if you know of a blog that has also participated in Autism Awareness month, but isn't on my list, please let me know.